I've been wanting to do a simple series on seasonal qigong exercises for awhile and now seems like a good time. Qigong (pronounced "chee-kung"), like Tai Chi, is a meditative movement and breathing practice that circulates energy through the meridians of the body. It loosely translates to "energy skill." Medical Qigong is a form that focuses on strengthening and balancing the energy of specific organs. You don't have to be flexible or strong to practice it. You don't need a mat or special clothing. In fact, many movements can even be done sitting in a chair if you're feeling especially weak or fatigued. It's something that nearly everyone can do safely and it's a very healing modality for people with chronic fatigue and adrenal fatigue. Ideally, you want to establish a consistent practice, even if it's only for a few minutes a day. Consistency is important. Since it's Autumn, we'll start with the lungs. This is the perfect time of year to work on strengthening and balancing our lung qi, as well as to release negative emotions that are associated with the lungs which often tend to arise during Autumn. As the weather gets cooler and the humidity of summer leaves, the seasonal energy shifts to the element of metal, which corresponds to the energy of the lungs. In Traditional Chinese Medicine, the lungs are impacted by the negative emotions of sadness and grief. They are the bellows which move qi throughout the body and they govern the energy of our protective energy field called the Wei Qi field, which corresponds to our innate immune system, and works to keep pathogens at bay. Each organ has both positive and negative traits and emotions associated with it and the positive traits of the lungs are courage and integrity. Qigong can help us to develop those positive traits over time. Each organ is also represented by a color and an animal. In the case of the lungs, the color is white and the animal is a white tiger. I like to imaging that the white tiger is the part of my immune system that prowls about, protecting me from pathogens. Good kitty. Symptoms of lung energy imbalances include obvious lung issues like asthma, coughs, bronchial issues, sinus problems, and allergies, but also constipation (the lungs are partners with the large intestines), and skin problems like dry skin and eczema, since the lungs influence our skin's protective mechanisms. Taking a few minutes every day to do a simple qigong exercise that strengthens and balances lung energy can help us to prepare for the immune challenges of winter, as well as to release sadness, grief, and any excessive pensiveness that may arise with the seasonal shift. If you'd like to focus on releasing emotions, you can add a "Sssssssss" sound on the exhale while you imagine grief and sadness exiting your body with your breath. This vibrates the lungs to help release the stuck energy of sadness and grief. This article explains more about how the lungs are impacted by grief and it contains helpful tips, including dietary tips, to cultivate healthy, balanced lung energy. Below is a video with a simple exercise to balance and strengthen lung energy. Remember to keep your breathing relaxed and breathe into your belly, rather than into your chest and shoulders. I like to imagine my breath as if it's dropping down through one of those narrow-necked squashes and expanding once it reaches my belly. This video is great for learning qigong breathing. Another tip that increases the effectiveness of qigong breathing is to keep your perineum gently contracted to "seal" in all the energy that accumulates in your lower abdomen. This is a technique that is often not taught to qigong beginners, but it makes a difference. 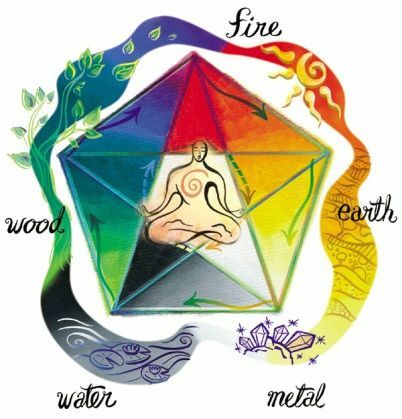 If you'd like to incorporate some healing color imagery, you can imagine that you are inhaling white energy or white light, the color of the lung/metal element. I like to do a few repetitions of "channel dredging" before I begin any qigong movements. Channel dredging opens up the channels/meridians for better energy flow. It's also energizing and can feel great to do when you want to release the feeling of having negative or blocked energy or just need to blow off some steam. If you are interested in learning a complete qigong routine that includes all of the organs, I highly recommend the dvd Chi Kung- The Healing Workout. It includes an extra section on proper form, which is helpful and makes a difference in how effective your practice is. This is the same routine I learned in Medical Qigong school. Here's to happy, healthy lung energy and a wonderful Autumn!